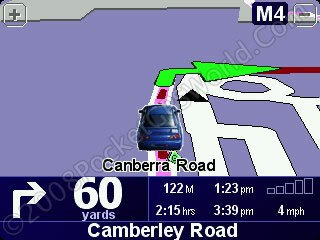 With some versions of Navigator 7 TomTom added the ability to use custom cursors when in 3D map mode. Officially these custom cursors can be used on all x20 and x30 models and ONE and ONE XL models upgraded to Navcore Version 8. For other TomTom devices running version 7 or newer read on for a workaround. If you have cursors you would like to submit for inclusion on this web page please either post in the cursor thread linked at the foot of this page or email to me. My email address is available via the 'Contact PocketGPS' links on the left hand side of every web page on this site. Please Note: The cursor files available on this page are supplied for your personal use only. You may NOT share these files on other web-sites, distribute them or share them through P2P or TT HOME without the express permission of PocketGPSWorld.com (or the original author if different) who retain copyright at all times. The original files remain copyright of their individual authors but are used here with their permission. Please consult the Licence terms at the foot of this page before use. Detailed installation instructions and a work-around for older units that do not support custom cursors out of the box can be found at the bottom of this page here. All the previews below are in .jpg format for preview only. 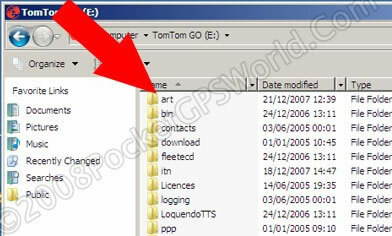 To access the correct .bmp version that is required for your TomTom single-click the image, this will load a pop-up window with the correct .bmp format version of the cursor. Right-click and select 'Save As' on this image. for a donation (proceeds go to the Leukaemia Research fund). Custom cursors are only officially supported on the GO x20, x30 and certain ONE models upgraded to v8. There is a workaround for other older models that have been upgraded to Version 7 explained below produced by TomTomHeaven.com. Please note that the custom cursors are only in effect when your map is set to 3D mode. In 2D mode the default blue triangle is always used. To install you need to copy the .bmp (bitmap) version of the cursor to the art\cars folder on your TomTom device. The .bmp file version of the cursor can be obtained by double-clicking the previews below. The image that is then displayed is in the correct .bmp file format and can be saved to your PC. Locate the cursor you wish to use in the previews below and double-click. A new page will load with the .bmp version of the cursor displayed. Save this image to your desktop or a folder on your computer. For PC's you right-click the image and choose 'Save As', for Apple Macs right-click and choose 'Save image to the desktop'. Connect your TomTom to your computer as normal. All that remains is for the image you saved in step 3. above to be copied to the correct folder. If you browse your TomTom device you will see a folder called art. Within this folder is a sub folder called cars. Paste the cursor image into this folder. Open 'Change Preferences' from the Main Menu. If you have correctly followed the steps above your new cursor will be shown amongst those available for you to choose from. Workaround for v7 models that do not have native custom cursor support. Please Note: This requires use of as third party tool. We cannot be held responsible for any issues arising from its use. Download this .zip file which contains the missing 'art' folder, a default arrow and a custom cursor to get you going. You will then need a third party utility, the TomTomHeaven Explorer available here . Save the default Arrow cursor by clicking 'Save'. So long as you left your GO connected after installing the 'art' folder in Step 2 above you will see this screen. The file list shows all the cursors you have copied into your 'art' folder. Choose the one you wish to use as your default and click 'Apply'. When you see the 'Congratulations' message the deed is done. Click OK, exit the application, undock your GO. Locate a suitable image or take a photo of your own car. The best cursors are those that are viewed from the rear but slightly above the car rather than from directly behind. The image size should be re-sized to 80 x 80 pixels. For optimum results a continuous 1 pixel white border should be added around the cursor. The image should be saved as .bmp (bitmap). You can easily experiment with your cursors or take a look at some of the ones supplied with the device to see how they have been designed. You may copy these files for you own use without financial gain only. You may NOT use the files for commercial purposes nor may you share uplaod or otherwise offer them in any format to third parties. The files are provided "as is" without warranty, either expressed or implied. In no event shall there be any liability for any damages whatsoever. Copyright (C) PocketGPSWorld.Com Ltd, 2012, . Individual cursor authors have not been acknowledged here but most can be found in the cursor threads of our forum linked below. Have any comments about this page? Post them in the forum thread here.